If hot dogs with cheese are good (and they are), imagine how amazing a hot dog dish with four cheeses would be! 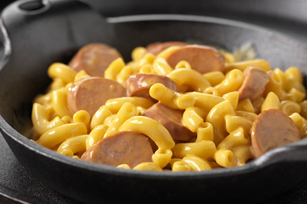 Cook Macaroni in large saucepan as directed on package, adding wieners to the boiling water for the last 7 min. Drain macaroni mixture. (Do not rinse.) Return macaroni mixture to pan. Add 1 pkg. (10 oz.) frozen broccoli florets, thawed, along with the Cheese Sauce. Cook and stir until mixture is heated through. Serve with fresh apple slices and a crisp mixed green salad tossed with your favorite KRAFT Dressing.